In Chicago, 1983, four real-estate agents have been forced into a sales competition to save their jobs. He who closes the most deals and makes the most profit wins a Cadillac, second prize is a set of steak knives. The two remaining will be fired. What each of these men need to succeed is the good ‘leads’ – the clients most likely to buy. But only those who close the most deals get the good leads. 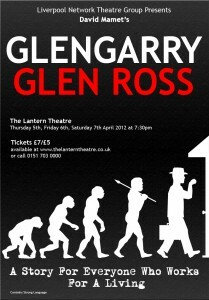 Glengarry Glen Ross was performed on the 5th, 6th and 7th of April, 2012 at the Lantern Theatre in Liverpool. Directed by Stewart McDonald and produced by Sonia Chapman, it starred Rob Rankin, Paul Arends, Darren Jones, Albert Hasting, Russell Carragher, Mike Sanders and Colin Rice.